Grease and prepare a muffin tin with nonstick cooking spray. Put the butter, sugar, cocoa and salt in a microwavable dish. Microwave until butter is melted. Gently stir all the ingredients together until incorporated. Your batter should be warm, if it is hot, leave for a few minutes to cool down. Add the vanilla essence and mix it through. Add the eggs and mix thoroughly. Lastly add the flour and mix until incorporated, you should now be left with a sticky, shiny wet batter. Add spoonfuls of batter into the muffin pan ¾ full. Add a Rolo to each cup. Have your oven rack set on the lower half of the oven. Bake for 10 – 12 minutes at 190°C. 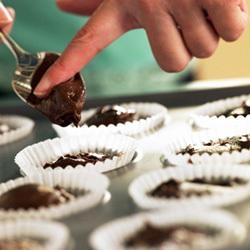 Leave the brownies to cool in the muffin pans, and carefully remove with a fork.